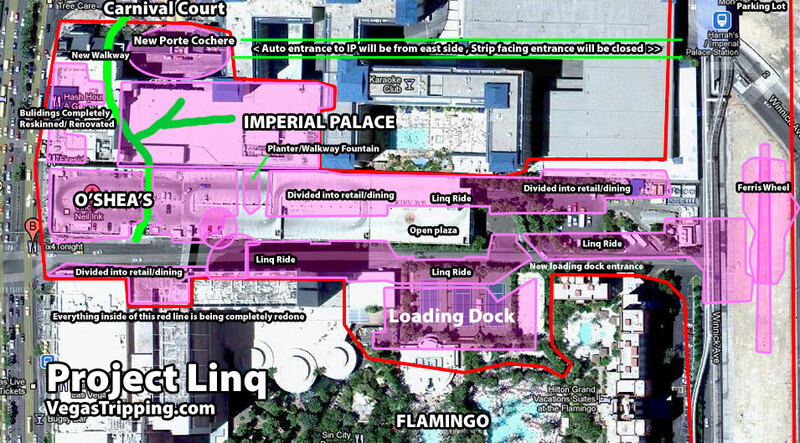 Rejoice Vegas construction junkies, work on Caesars Entertainment's Linq has hit full vector. This major renovation of the area between Harrah's and Flamingo (Imperial Palace) hit its stride with the closure of O'Sheas and has rippled outward with incredible speed. In this, the first of a two part post on Linq construction, we're gonna take a look at the over all plans for the project and take a quick peek at what happened to O'Sheas. In the second part, we'll eyeball the major renovations taking place in the front third of the Imperial Palace. But first, let us quickly review the plan for Linq, which you can pop open in a new window here. When completed, Linq will connect the Carnival Court area at Harrah's with an outdoor shopping/dining/entertainment plaza being built where O'Sheas and the adjacent side street once were (as noted by the big green line on the plan.) Accomplishing this requires renovation of the Imperial Palace's front driveway, the former Rockhouse Bar area, the IP's strip frontage, reservation area and a complete rethinking of the O'Sheas building. And by rethinking, we mean tearing it down to the steel and concrete basics and starting again from virtually scratch. There was a time where the only place I wanted to be was right there, playing dice, with a smattering of Come bets covered in odds and a Guinness on the rail. Workers were up early the next morning demolishing those top rails. Are all Bobcat drivers lunatics or is that just the way the machinery operates? At night, there is no security back there. Looking down Linq Blvd from the Strip. Looking toward Linq from as close to the strip as you can get from Koval. It is amazing how large this little sliver of construction actually is. Work on the exterior of the Imperial Palace is also in full swing with the sidewalk now moved onto Las Vegas boulevard and protected from falling debris and drunk drivers by an incredibly fortified sidewalk canopy barricade. So the Ferris Wheel will be on the other side of the Monorail ? I will the old girl! Place was alot of fun. Glad that they are finally doing something to the exterior of IP, hope the hotel remodel comes out looking real nice. I'm excited about this. from the strength of that last pic, it looks like the strip side will be under construction for at least another year. sound about right? thanks for the updates, love seeing this take shape. Why couldn't they just have left O'Sheas alone, and imploded part of the IP, and put their Linq blvd project & ferris wheel monstrosity over there? Still wonder how a company carrying just 19 billion in debt can find another half billion to do this. Should have majored in finance. A small part of died seeing those photos. I guarantee more people will ride the Ferris Wheel than have ever rode to monorail but some will think the monorail is part of the ride. Yeah when I was out there in May you could see them drilling large angled anchor blocks deep into the ground for something to be mounted too on the east side of the monorail. I'm pretty sure they were the for the ferris wheel. Being out there a few weeks ago, I noticed the construction workers doing something to the tiles on the front of the IP.. Not sure if they were pulverizing it and shearing them off or just powerwashing them, but a change in the frontage is definitely welcome. If I thought a whole renovation like they are doing at O'Sheas would be good, I would say that too, however the chance it might make the low budget prices of the IP disappear is too great. However inside, there's construction from the early mornings to late nights all over th casino floor and secret passages toward the 1 and 2 Towers as well as the old sliding door entrance area.. Can we get at least new carpet or something in there.. At least the service staff is nice.. but that's not mentioning the front deskers. Those guys, man. It's like the new brass at CE HQ decided no more free upgrades, even if available.. Kinda makes me want to go to the other competition hotels, just cuz.. I couldn't stand going thru that claustrophobic walkway during Mem Day wknd more than once, so I spent all my time across the street and didn't venture once into Flamingo, Ip etc. for the whole two weeks =. They will lose a LOT of business til the construction is complete! MGM had a similar covered walkway while they were building CityCenter.